This is my first look at the 2018 Absolute football. These cards that are a lot of color but aren't really my thing. I like the scans better than the cards themselves. In hand I'm just not that excited. I did like my pull which gave Devonta Freeman right off the top of the pack as well as other stars. The backs aren't bad. 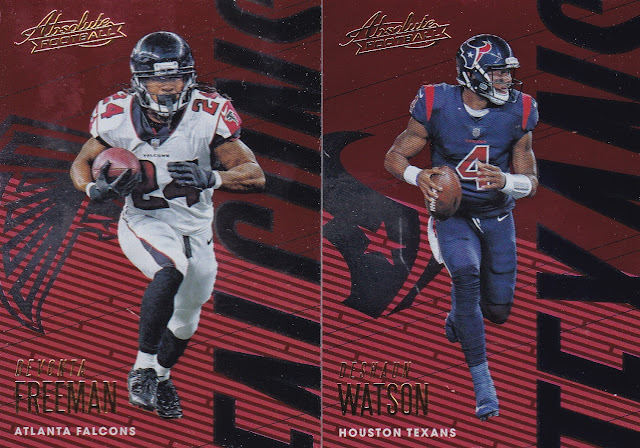 They have some color, a nice team logo and it is has a format that is a bit different from what we normally see on the backs of cards. The 1-2 punch is nice and I'm all for retired greats so the Dan Marino Revolutionaries card is fun. More star power from this pack. I want to like these cards the more I look at these scans but I'm not sure I'll get there. The price point (20 cards per pack) is a downer as well. I will be curious to see what others think of this set. As crazy as he is it is hard not to like Marshawn Lynch.